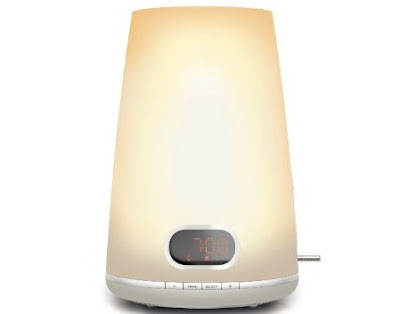 On the 8th day of Christmas, Domestic Sluttery gave to me... an awesome Wake-up Light from Philips! Remember I told you about Philips taking me to the Arctic Circle to play with their Wake-up lights? Well they're feeling super generous as it's Christmas and they've asked us to give one of you a wake-up light! Hurrah! This light is slowly changing my sleep pattern with it's slow release morning light and tweety bird noises. It's not making me get out of bed (it's not my mother, it doesn't shout at me and steal my duvet), but it makes me perky. Sprightly, even. Some might say annoying. We'll pick a winner at random and announce who won after the weekend and that lucky person will have awesome sleeps for Christmas. Good luck everyone! The small print (yawn): The competition will close at 8pm December 10th. You must be UK based, sorry overseas readers! You must also leave a name as well to make sure we know who you are! If you're anon, your entry won't count and if you enter more than once, we'll discount all of your entries (yes, we do check). We're not allowed to enter our own competitions, but Siany makes tea and has to wait very patiently for her parents to wake up before she can open any presents. It's very unfair. We wish we could enter our competitions. Humph. The first thing I do every year is convince my dad that digging into a selection box counts as a proper breakfast. My Christmas morning is all about the presents. Then chocolates, then tea. I'm retweeting as @dolly_clackett. I'll leave it to you to pronounce it as spam or not. Bacon sandwich and Bucks Fizz, obviously! The first thing I do is have breakfast, I can't function in a morning till I've eaten. On Christmas morning the first thing we do is fight over the bathroom, just like any other day (with 4 girls + 1 bathroom it's not easy - my dad doesn't even get a look in). We're not allowed presents until everyone is dressed. The first thing I do is have a cup of tea as instructed by my other half who wont let me open presents until we've done that. Find a corner shop that sells batteries! The first thing I do when I wake up on Christmas morning is wish I wasn't the youngest - my sister got a stocking until she was 27.... that's the year I turned 18 and my Mum decided we were all past stockings now.... I'm 33 now and I still resent it! I would dearly love one of these wake-up lights. The cold dark mornings mean that no matter how early I go to bed I'm always dragging myself into a cab to work - it's sending me bankrupt!!! The first thing I do is put the kettle on, so that we can open our stockings with a cup of tea....before we start on the champagne, of course! The first thing I do on Christmas morning is wonder at what I thought I would achieve by drinking my bodyweight in gin the night before and wonder whether i woke my parents up getting in at 2am (It's always weird staying at theirs over Christmas). This is swiftly followed by searching for my thickest pair of socks. There is also the hope against hope that we'll have scrambled eggs with smoked salmon for breakfast washed down with a bucks fizz (for medicinal purposes for the hangover). The first thing I do is try and get my boyfriend up to open presents. He likes his lie ins and it's not easy! Grab my stocking and squeeze it to see if I can guess what's inside. And then realise it's 4am and I really should be asleep. I wake up and drive to my sisters, lugging all the gifts for the kids and then have a breakfast of scrambled eggs and ham and watch the kids tear open their gifts, then the adults have a go. It is a long process but watching the kiddies first is nice. OOOh fist thing I do is watch the boys tear the wrapping off their stocking presents whilst I crave a strong black coffee!!! The first thing I do is put my 3 daughters back to bed as its always only 3am!! First thing is all about the stocking, yes I may be 26, but Father Christmas still drops by with a few goodies in a welly boot sock- hurrah! Same as any other morning. TEA. I Need Tea. My parents still put out a small pillowcase (for some reason we never had stockings) and fill it with presents.. I take this downstairs and put it under the tree and run to the kitchen where the pastry-based breakfast feast happens: Gorgeous flaky croissants with jam and butter coupled with fresh strong coffee! We devour these and get on with the unwrapping while my Dad gets started on the cooking (with a running commentary of OOhs and AAhs shouted from the living room). The morning is always the best part of Christmas day. First thing is a proper cup on non-instant coffee and cream. The quiet before the storm . . .
A glass of Baileys and a bar of Dairy Milk each. It's a family tradition - the only one we seem to stick to - I wonder why?!! Run down stairs and switch the fairy lights on - it's the sign to my LO that Father Christmas has been if the lights are on! The first thing I do on Christmas morning is to break out the 'Oxfordshire fizz' with my Dad (who's from Oxford). It's like Bucks fizz, only better- with the addition of Cointreau. Believe me nothing gets you in the festive spirit more than a couple of these on Christmas morning. Hic! Breakfast of Quality Street. Definitely. Ideally no real food should be consumed until Chrismtas dinner, to make it taste even better! This year the whole family are taking over a village in Somerset, so I'm hoping the first thing we do is run around in the lovely clean snow! Ooh, I've wanted one of these lights for ages!! First thing on Christmas morning? Open presents with my OH, while still snuggly in bed! Love it! Always smoked salmon, scrambled eggs and a glass of Bucks Fizz! Looking forward to it already! A cuppa gotta have that cuppa, then tree lights on! Yay it's Christmas!!! The first thing I do is think "But I've only just gone to sleep!" when our 6 kids kids run in and bounce on the bed...good times! A cup of tea and some posh breakfast in bed. That's how I start my leisurely Christmas morning. sneak downstairs to switch on all the fairy lights, on the tree, in the window, around the doors and picture frames before the children wake up. Then the first thing we do when they wake up is open the front door to check if the reindeer has gone (a mix glitter and porridge oats), if it has they know there will be presents under the tree. Hmmm, reindeer food I meant to say! I have a little tradition with my younger sister. Although we are 28 and 24 respectively we always naturally wake up at 5am due to the sheer excitement of Christmas. We have a cuppa in our dressing gowns and watch retro cartoons until the rest of the family rises about 9am. It's an odd tradition but one that happens every year, no matter how hungover or tired, we both wake without alarm clocks to spend that special few hours together before chaos descends the Hudson household. Definitely a cup of tea first, then going downstairs to eat toast and marmite and open some pressies! Ooh, this is making me feel all warm and Christmassy. First thing is breakfast - usually apple pancakes to keep us going through the present opening!! First thing in the morning is my favorite part of Christmas day, as since we were tiny, when Sylvanian Families were the gifts of wonder, I've been going and tucking into the end of my big sister's bed, and we'd open our stockings together! This happens every year no matter what - even as teenagers when we had fallen out, or uni years when tea was needed to get us out of slumber; before anything else can happen we open these together - even more special now we're both almost 30, and it's our best part of the year together! The first thing I do on CHristmas morning is wake up my boyfriend and run into the living room and start ripping the daylights out of my presents! First thing's first: Champagne and smoked-salmon and cream cheese bagels. It's the only acceptable way to begin Christmas day. First thing is the same as it's been since I was tiny - I go and get into my parents' bed. We don't get stockings anymore, but we have a cup of tea, bit of toast and say happy Christmas to each other before getting up and heading off to church. First thing I do is open my stocking and admire the £1 coin, satsuma, bag of chocolate coins and shower gels etc that I receive every year but still get excited about. Nothing like a stocking to remember the childish excitement of Christmas. As weird as this sounds the first thing I do on Christmas day is sit watching my parents do some kind of DIY on the house. The first thing we do is wrap up warm, get our 4 dogs in the car and go to the beach for a long morning christmas day walk - we normally have the whole beach to ourselves. then when we get back we all have a cooked breakfast, open our pressies and cuddle up on the sofa with choccies and the tv remote. At the crack of dawn I sneak downstairs and set up my parents' christmas stocking! Then I spend the whole morning trying to convince them it was totally santa! Christmas morning my boyfriend and I exchange one little gift each before we go downstairs and join the rest of his family. Usually it's new knickers!! First thing Christmas morning... Wake the mister up with the three C's- cuddle, cuppa & croissant. And a pressie or two, obviously. First thing is kiss for hubby (as we just got married...awww), then cup of tea and presents with the whole family. My favourite is the presents I get from the cat, dog and chickens ( yes they do presents too....)! First thing on Christmas morning... Wake up at silly o'clock and run into mum and dad's room to announce that "he's been" and make them get up. We have a glass of buck's fizz and a cup of tea and then sit by the tree opening presents. It's been this way since I were little... I'm 34 btw! The first thing I usually do is pretend to be asleep to wind up my little sister. Wake up with a mild hangover and momentarily wonder where I am (the futon bed in my mum's attic, under a duvet with a cartoon duvet cover from my childhood). But then mum brings me a cuppa and I remember that there is a cheeseboard breakfast and two cute cats to play with downstairs! I still jump into bed with my parents to open the Christmas presents. That might be a bit weird now I'm 24.. I usually still shout '5 more minutes!' to my mum as she doesnt quite get the idea of a lie in on her day off! Then we'll have a cup of tea and start on the important stuff...FOOD!! Drink hot chocolate! We open our prezzies on Christmas eve. I reach out my toe (usually the big one on my right foot) and listen for the rustle of paper from the presents in my stocking. Then i get over-excited and jump up and down in bed a little bit (waking my b/f in the process). Then depending on where i am i either open the presents as quietly as i can to avoid waking people, or my sisters and nephews all pile onto the bed and we open presents really loudly because no-one is left asleep. The first thing I do on a christmas morning is put a pot of fresh coffee on, get the bacon butties on the go and the glasses of bucks fizz, then we all sit around the christmas tree and open our presents. It's lovely. Make myself and all my family a cup of tea, and then sit there in our pyjamas and work through the Christmas stockings..usually means a breakfast of chocolate! The first thing I do on christmas morning is wake up and open my christmas stocking! Yes I am 28 and no longer live at home but my mum still leaves one for me and my boyfriend by my back door-usually with lots of glitter and a sign saying 'Santa has been'. You are never too old for that! First thing for me on xmas morning is a cup of tea (and if I've set it out the night before, the mixing of dry and wet ingredients + shoving in the oven some xmas muffins ala Nigella.) Then some presents! I wish everyone a Happy Christmas! The very first thing I do is cajole my husband into making me a cup of tea. Then it's on to the stocking presents left at the end of my bed. Ooh, I'm already getting excited! Kettle on for a cuppa and feed the dog! I still get in my parents' bed with my sister to open my presents from 'santa'. And I'm 26! First thing is get a cup of tea to wake me up. Make a cuppa and watch the kids open their stockings. It's all about the children! I'll watch Steve make me the best fried eggs served up on the best homemade bread in the world. The boy should do it for a living. After being woken up by my scrumptious triplet girls. The first thing that I do on Christmas morning is spritz the perfume on, brush my hair to make me look delectable for the Christmas morning photos , bucks fizz in hand. First thing I do Christmas Morning is gather up my presents from there hiding places and take they down to go under the tree. I'm in my 30's, my Boyfriend in his 50's but if I don't hide the presents until Christmas Morning, he has ripped them open. My Mums the same. They go on hunts together because they can't take wait until Christmas Day. This is why we don't have kids yet. Very first thing our eldest children creep in and ask if it's too early to get up, which it will be (even though we are excited too!) Then a bit later all four kids come in and open stockings from Father Christmas(actually cute sacks with their names on)on our bed. That is my fave bit of the whole day. I am then mean mummy and make them do unreasonable things like eat and get dressed before they descend on the pressies under the tree downstairs! First thing in our house (at home) is a cup of tea and a pain au chocolat - and when everyone is up and awake we split up into two groups and count down to opening the 2 doors to the living room where all the presents are - much squealing and excitment from me and my sister even now (at 28 and 31!) and opening of presents in pyjamas. My husband sometimes gets dressed as he feels a bit odd about the pyjamas, don't understand that at all! I haven't been able to celebrate Chrsitmas for the past 7 years due to family problems, but this year it's back on the agenda thanks to my gorgeous boyfriend! I'm hoping (not told him yest) that I'll be able to stay in bed while he walks the dog and makes me a cuppa to enjoy in bed! As I have always trained my kids to stay in bed til at least 8am on xmas morning because Santa has to deliver toys all around the world and might not have come to our house yet (and of course only comes when children are sleeping), I get into the living room before the kids (even though I'm not a morning person), put the xmas lights and the fire on, all cosy, make a pot of coffee and then wait for their excited faces to come through the door. All days start the same, coffee and nicotine. Then they can get interesting! Christmas Morning usually starts with a smile as we listen to my son (who is 7 and a cheerful early morning type person)singing to pass the minutes until the agreed time that he is allowed out of bed (7am really IS the earliest that that I can face the day even on Christmas morning).... hearing him exclaim when he realises he has a stocking packed with presents at the end of his bed..... and then hearing his running footsteps as he goes down the corridor to try wake his older sister up with the exciting news (she's NOT an early morning person at all and would really benefit from having a Wake-up Light....).... knowing that we have maybe 2 minutes left until all the excitement and wonder is shared with us too and they bring their stockings into our bed to open them while we watch, bleary eyed but smiling. Dragged out of bed by the kids eager to open their pressies from Santa and show me what he got them. First thing I do on Christmas morning is put the kettle on for a cuppa! We open presents on the 24th, so Christmas morning is for catching up for the sleep I don't get during term time! When we visit my family, it's presents first. Since we're not allowed to open presents until 7am, any coffee or breakfast has to be made before then. When we visit my husband's family, we have coffee. And then breakfast. And then we admire the snow. And then we prepare lunch. And then we eat lunch. Presents get opened around 3pm, around a roaring log fire. Yes, it's civilised and beautiful. But it's not as much fun. The first thing I do is give my hubby a kiss and enjoy just being together on Christmas. I know it's cheesy but it's lovely. The first thing I do to seem like an adult (and because that's always been our family tradition) is open my stocking, calmly and appreciatively. We always had to wait for everyone to get up before we could could open anything. I'm always first up, my brother last. First thing is that you have to get showered and put on something nice...christmas deserves a bit of a dressup! Then croissants, oven warmed (slightly burnt cos thats how dad does them) and coffee. Then (only AFTER breakfast, this is very important) straight into it...champers and pressies! I wake up, grab my stocking and head to open my stocking presents with my brothers. We've done this since we were kids and it's the perfect start to the day...laughing at all the silly and funny presents over a shared satsuma from the bottom of the stocking! I'm always the first awake on Christmas morning. I then poke my husband until he says I'm allowed to go and drag our sleeping teenage daughters out of their beds. They come into our room and, for the only time ever now, have a snuggle in bed with me, whilst dad goes downstairs to check if Santas has been yet! Next up is coffee and a chocolate before the first present is opened - everybody is in dressing gowns, the heating is on, the curtains are still closed on the deserted streets and it's a time for celebrating the tiny world that is our family. Oh wow, do I ever want this! First thing I have done on every Christmas morning prior to this is crawl to the bottom of my bed and feel about in the dark for the stocking hanging on the end of my bed - never gets old! This Christmas, however, the first thing I'll be doing is breast feeding my 6 month old! How times change! I still wake up and open my stocking presents. Then Mum and I open the champagne and the days rolls on from there. Bearing in mind the 1 hour time difference, as well as the ridiculously early time kids insist on getting up on Christmas Morning, this Wake-up Light would be just the sparkly spangly ticket to help me through this festive season (and beyond)! This will be my first christmas with my new husband, so we have no traditions yet except those that we are merging from home. This year the first thing will be to open the stockings of little things we have got each other, lots of little things. Without sounding like a do-gooder, I'm up at 7am to go to the homeless shelter I help run in London for the past few years, usually running on mince pies for the day. Don't worry, I'm in a pub lock-in by 4pm! I'm 41 but I've never got over the excitement of waking up and feeling that weight from your lumpy stocking at the end of your bed. now we're all grown up we each buy two stocking fillers for everyone else in the house so that my mum doesn't have a nervous breakdown. Then I get up and have an espresso and attempt to entertain my nieces and nephews until their parents stir. I'm an early riser so by the time they all come down to breakfast I'm ready for the glazed ham and poached eggs we have for breakfast every year. Having got married last year, this will be the first Christmas day I'll spend with my husband's family, so I'm not sure what the drill is yet. I'm really really hoping that the day will start with him bringing me a cup of tea and breakfast in bed (mornings aren't my strong point), but I'm guessing that might be wishful thinking! On a Christmas morning, I usually attempt at a lie in, only to have my plan scuppered by Mum yelling up the stairs at me (which isn't a pleasant wake up call). I drag myself downstairs to open presents, which eases the pain a bit, and spend the rest of the morning trying to help mum avoid bursting into tears from the stress of cooking, usually with helpful amounts of whisky. My husband does all the cooking for Christmas lunch so first thing is breakfast made by me - always the same for last 10 years - Bucks Fizz, smoked salmon, scrambled eggs and toasted bagels. Bliss. And that's my cooking done for the day. After a cup of tea for hubby and coffee for me, we all open the presents together followed by our Christmas breakfast: eggs benedict and smoked salmon on toasted muffins, Panetone and Christmas muffins with more tea and coffee! Et voila! First thing I do on christmas morning is put the kettle on for a nice cup of tea. I can't function untill I have my morning fix! After a quick coffee I make a start on prepping dinner for our large family. Without doubt, bucks fizz! Then it can be sipped in the bath, whilst getting dressed, with breakfast and then of course when opening the pressies!! Put the sprouts on so they are cooked in time. Only joking. Let the dog out, put the kettle on and grav the bathroom before our visitors wake up. I'm always the 1st one up. I was brought up as a muslim so I never had Christmas celebrations as a child, not even a tree. Then I met my lovely husband 12 years ago and we spend Christmas with his family every year. I'm looking forward to my 12th Christmas therefore to me it's as I'm 12 years old. I'm always the first up and bring in the stockings (we're in our early thirties but who make the rules eh). I don't look until my husband is awake, so I spend time pottering about the quiet house, looking at the bobbles on the tree and re-arranging the presents. I set up the coffee filter machine and get the white bread, butter and marmalade ready for toast which is a always a Christmas treat as I usually eat brown bread and margarine. Then I wake up the husband, we open the stockings and of course eat some of the chocolate gold coins his mum manages to get for us each year! Up until the age of about 16, I would lay in bed pretending to be asleep until my parents put my stocking full of presents at the end of my bed (usually around 1am). As soon as they'd crept out, I'd open all my presents in record speed, immediately feel guilty and go to sleep. Now I'm a little older, I try to wait until at least 8am and follow the presents with smoked salmon, scrambled eggs and bucks fizz. Caffeine - it just has to be caffeine. There is no way I can cope with the whirlwind of wrapping paper and cardboard boxes that is an over-excited little boy attacking his pile of presents without it. Especially not when they all require a degree in engineering to get them out of their packaging (is it just me or do those little white ties get worse every year?) and it's too early to be awake let alone capable of following instructions. As every day: put the kettle on, feed the cats. But... bring tea in bed, admire the tree and presents and get started on the smoked salmon + scrambled eggs for breakfast. With orange juice or Bucks fizz, like many other people! we start the day the right way with dippy eggs and marmite soldiers and then presents! As my Birthday is Christmas Eve, my first thought on Christmas Morning is usually "Oh hell, another year older!" Then coffee. I am up with the sparrows on Xmas morning because even though I long since seen childhood , I still feel like a kid. I then have to wake everyone up and we must gather in the lounge in our pj's. I will then proceed to make hot drinks, put out the mince pies and then start handing out the pressure. I get so much joy from people opening their pressure that I will wait until the end to open mine . Xmas morning is all about eating chocs and enjoying the pressies before I start cooking. Love it!!!! Christmas morning begins early, lying snuggled up in bed, remembering the intense overwhelming excitement of christmas's past as a child. Realising the joy of being a child and reflecting that deep down we're all children and resolving to make sure future generations get to experience the same joy. A rush to the tree and a furious ripping open of presents and hugs all round ! Since meeting my wife, Christmas has become magical for me again as it was when I was a kid. We've established our own tradition - we stay up till midnight and at one minute to go until it is officially Christmas Day we play Fairytale of New York with my wife singing Kirsty's vocal and me doing Shane's both of us giving it all we've got. Then it's Champagne corks popped and we dive on our presents like kids. This can go on till 4am. I love Christmas. Is it blasphemous to say I check my emails? To be fair on my own sense of christmas spirit, I have friends and family all over the world and the first thing I like to do is check on my greetings from them and send out my own. After that, it's all about presents and chocolate for breakfast, rest assured. I give my husband a big cuddle and wish him 'happy christmas' then demand he make me a cup of tea in bed whilst I turn over and have another 40 winks! Then later we'll go downstairs together and start on the Bucks Fizz ;-) (whilst crossing our fingers and hoping the kids don't wake up so we can have 10 minutes peace!). Pancakes!!! Massive thick American style pancakes, with Aunt Jemimas syrup, and the last advent chocolate in the middle of one of the pancakes. The whole church - presents - massive lunch thing does not go off well if my Christmas doesn't start with pancakes. Wake up, check my stocking's there, then wait until it's an acceptable time to go and sit on my parents' bed withmy little sister and open presents in our pyjamas. The first thing I used to do as a child is check my christmas stocking, eat a satsuma and start reading whatever book was in the stocking. These days, I get up and eat a chocolate - cos if you can't have chocolates for breakfast on christmas, then when can you? The first thing I do is look out of the window hoping to see snow! Maybe this year? Then, it's a lovely Christmas breakfast with mum before presents. The first thing I do is jump up and down on my parents' bed to wake them up. Yeah, I'm 28. What of it...? First thing I do? Kiss and cuddle my man and my little girl...my best presents ever! Then it's getting the fire roaring, making a pot of tea and a pot of real coffee to fuel the insane present fest that is inevitable in our house! The first thing I do on Christmas morning is give the ferret a cuddle, we rescued her over a year ago and love that she's joined our little family. Swiftly after, it's a downward spiral of champagne and playing the game of "am i sober enough to cook the turkey". This year it will be feeding the cat bright and early to keep her belly full, and sleeping husband happy! In our house we open our stocking presents in bed then everyone has to be up, dressed and scoffed a yummy bacon sarnie before the main presents are touched! We spend breakfast time guessing what all the presents are under the tree by their shape and size so by the time we get our little paws on them we're super excited! I like to get up really early On Christmas morning (it's still dark) to prepare the veg etc and have some quiet time before the excitement begins. I try to find the most Christmassy thing on the TV to do it to and one year I managed to find the original Christmas Carol movie - it was magical! Ahhhhh! Christmas morning is always about the bacon & scrambled egg muffins and bucks fizz (may as well get started on the alcohol early). Then it's straight into the present opening. Traditionally, I wake my sister up and we sit in her bed talking and watch early morning Christmas TV. After a while (and when our patience has been stretched as much as we can bear), we go and wake our parents up. Then, we all go downstairs, have croissants and homemade jam, and bucks fizz for breakfast and open our presents afterwards. First thing I do is have a cuppa tea whilst eating chocolate and opening the presents with the kids. Then it's bucks fizz while cooking the dinner... mainly in my nightie...... then a quick shower and change to sit down. As soon as I open my eyes I'm overwhelmed by a sense of excitement, just like when I was a kid... of course the adult in me takes a deep breath, stretches, and heads straight for the coffee. Cup of tea, followed by an alka seltzer, followed by another gup of tea followed by opening presents and scoffing all the chocolate I can get my hands on. I am, without fail, woken at 5am by my sister (who is 21 I might add!) to go and open our stockings and see what santa left! Done, of course, with pancakes and bucks fizz. Generally we argue about who is going to open presents first, when they should be opened (immediately/after breakfast/lunch etc). Arguments are quickly dissolved by eggs and smoked salmon with champagne...we are all about presents, debate, food and more food! I'll retweet this as hannahsmeaton! No more comments now, thanks for playing everyone!